With Mother’s Day fast approaching, it’s time to remind mom about the importance in taking a well-deserved time out. From decadent and nutritious snack ideas, to taking a moment for mom, Green & Black’s has partnered with Canadian moms and celebrated foodies. Here’s our favourite foodie recipe courtesy of Lisa Canning – full-time designer, lifestyle expert and mom of six! 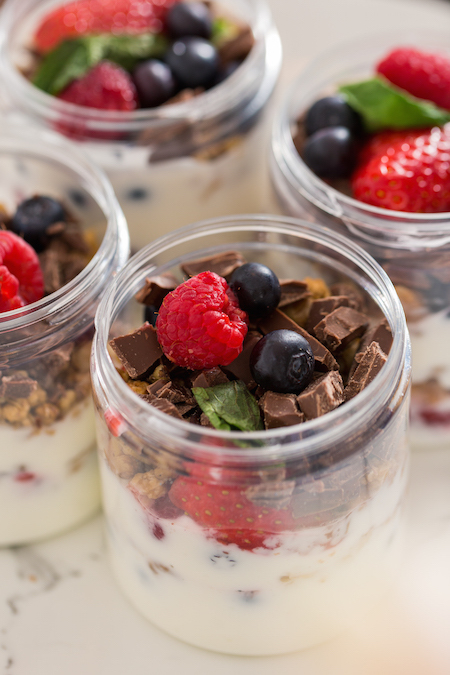 Directions: Spoon 1/4 cup (60mL) yogurt into each of 4 glass jars. Top each with 2 Tbsp (30mL) walnuts, 2 Tbsp (30mL) granola and 1/4 cup (60mL) berries. Repeat to make another layer using remaining ingredients or until jar is approximately 3/4 full. Sprinkle 25 grams (1/3 bar) chocolate to cover the surface. Top with more mixed berries and a mint leaf for garnish. Refrigerate until ready to eat.